My passion for design has been deeply influenced by the natural world, its harmonious balance of beauty and functionality. Nature is the never-ending source of inspiration. 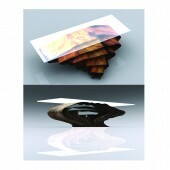 This furniture set was inspired by natural wood grain patterns. The curves softly flow from one another creating a unique flowing illusion that gives the set its stunningly light look. 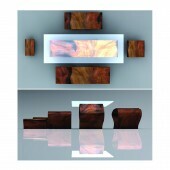 This is a cutting-edge design for those seeking something completely different and modern or just a practical set of furniture. This elegant design creates a graceful interplay between the organic lines and a contemporary look. “Flow” effortlessly fuses the worlds of sculptural art with product design, and makes a huge visual impact within many interior styles. Its adaptability is wonderfully suited for many settings from corporate to residential. The user can change the appearance and utility of the space by using multiple configurations of the pieces creating a stunning view. The design is simple and user-friendly. It can be used by almost any family member and does not require any assembly. I’m currently researching a cost effective an eco-friendly manufacturing processes. The mass production of this design would be quite easy and inexpensive. The set can be made of many different materials; some of them as plastic and plywood would be very cost effective from a mass production stand point. Conversely, the design could also be handmade from exotic types of wood, making it much more expensive but stunningly beautiful. Shipping would also be convenient as all of the pieces nest saving space and packaging. This same solution is also an excellent selling point to the Consumer who can use and store the pieces neatly in their home or office. The challenge was to find a harmonious balance of functionality and style in everyday objects. The design is very simple yet complicated and refined. It is a different approach to furnishing by creating something beautiful and useful which appeals to the different tastes of users. With a unique asymmetrical form each piece of the set is striking enough by itself, but position a few together and the effect is truly dramatic. 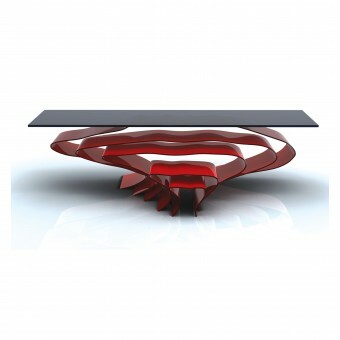 Flow Coffee Table & Stools by Olena Sydoruk is a Nominee in Arts, Crafts and Ready-Made Design Category. · Click here to register today inorder to be able to view the profile and other works by Olena Sydoruk when results are announced. 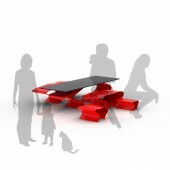 Flow Coffee Table & Stools by Olena Sydoruk is Winner in Arts, Crafts and Ready-Made Design Category, 2010 - 2011. · Read the interview with designer Olena Sydoruk for design Flow here. · Press Members: Login or Register to request an exclusive interview with Olena Sydoruk. · Click here to register inorder to view the profile and other works by Olena Sydoruk. Did you like Olena Sydoruk's Art Design? 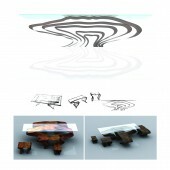 Did you like Flow Coffee Table & Stools? Help us create a global awareness for good art design worldwide. Show your support for Olena Sydoruk, the creator of great art design by gifting them a nomination ticket so that we could promote more of their great art designs.